There are 63 results for a “cucumber soup” search on FoodNetwork.com. On average, these recipes have about 12 ingredients and can take up to an hour of active preparation time. I find this ridiculous – it’s a cold soup, there is no cooking involved, what could possible take so long? 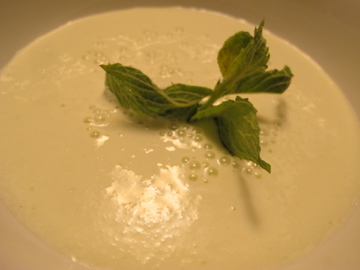 Granted, you can make Cucumber Soup as fancy or as rustic as you like, but if you are looking for something quick and healthy, try this recipe. For the dairy component of my soup I use Fromage Blanc, a fat-free French style cheese, similar in consistency to sour cream. It has a tang that usually minimizes the need for salt, lemon, or other acid, but feel free to add those things if you desire. Throw all ingredients in blender or food processor, blend until frothy, chill for one hour. Potential toppings or additions: chopped tomatoes, cucumbers, or potatoes, grilled shrimp or chicken, a dollop of sour creme or marscapone, a slice of lemon or lime. Voila.